Remember those Prairie Schooler chickens I stitched from the Welcome Spring chart ? Yesterday I decided it was time to debunny the tiered tray and fill it with chickens and daisies.. so I finished up those 2 chickens and into the tray they went! 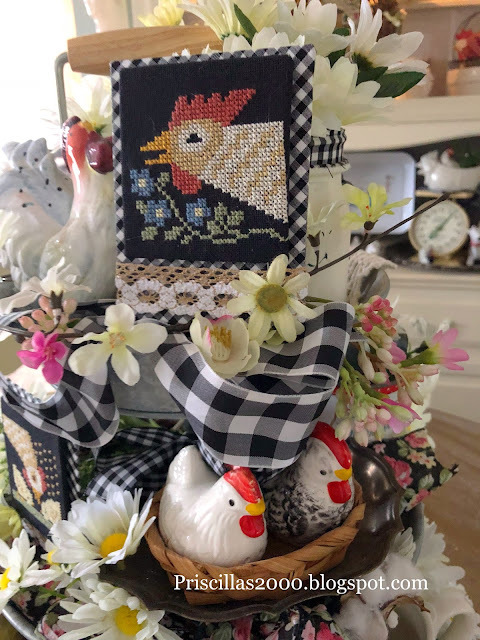 I have a couple other small chicken pieces that I will hopefully stitch and add to the tray .. 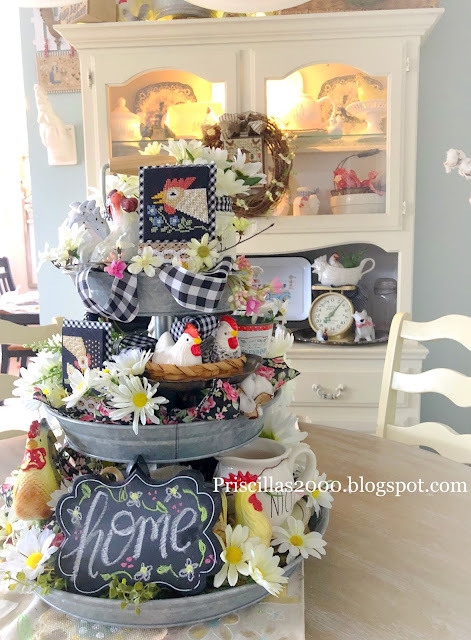 I finished them on sticky board ( of Course) and used more sticky board for the black gingham .. I added some burlap lace ribbon to the bottom ..and they are perfect ! 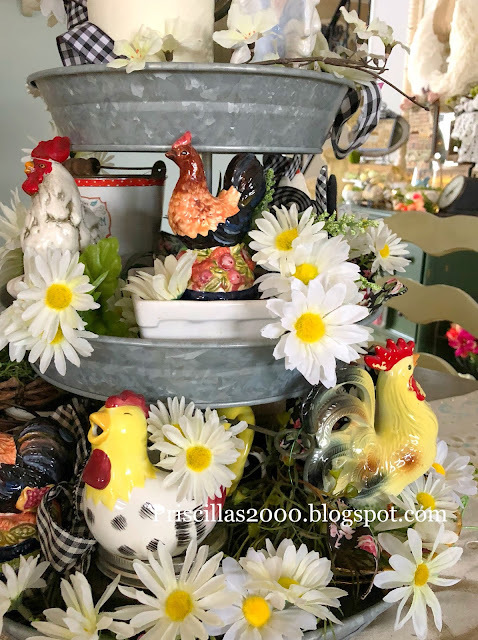 I have lots of vintage chickens in bright colors to mix with all the black .. black gingham ribbons and black floral ribbon are all in the tray ..
A chalkboard front and center with some greenery ..
aren't they just the cutest! the tray is filled all the way around .. with more chickens and daisies ..
Black and white checks are my favorite ... throw in some daisies and chickens and it couldn't be better! What could be better is it was not snowing here in Illinois on April 16 ! and that means the #meanestcatinamerica couldn't be left out! So that is it from me for today .. Hope you have a great week! 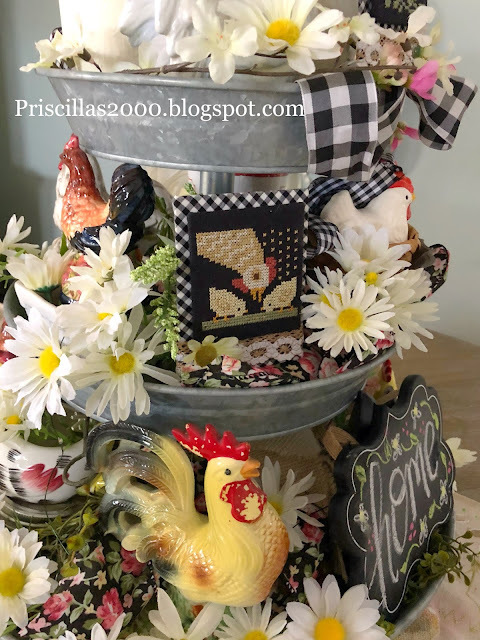 Your new chicken themed tiered tray is so cute, Priscilla! 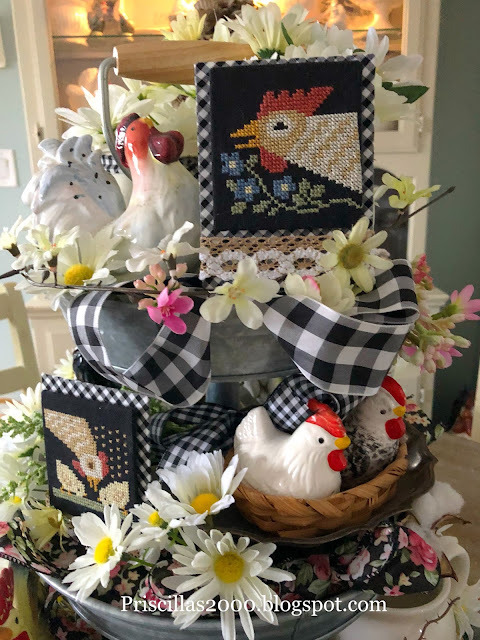 They look wonderful with all the black gingham and daisies. So sorry about your snow--I just glanced outside and saw flurries in the air here in western PA, too. But, it was in the 70s this weekend so they won't be sticking :) Hope things warm up for you soon! 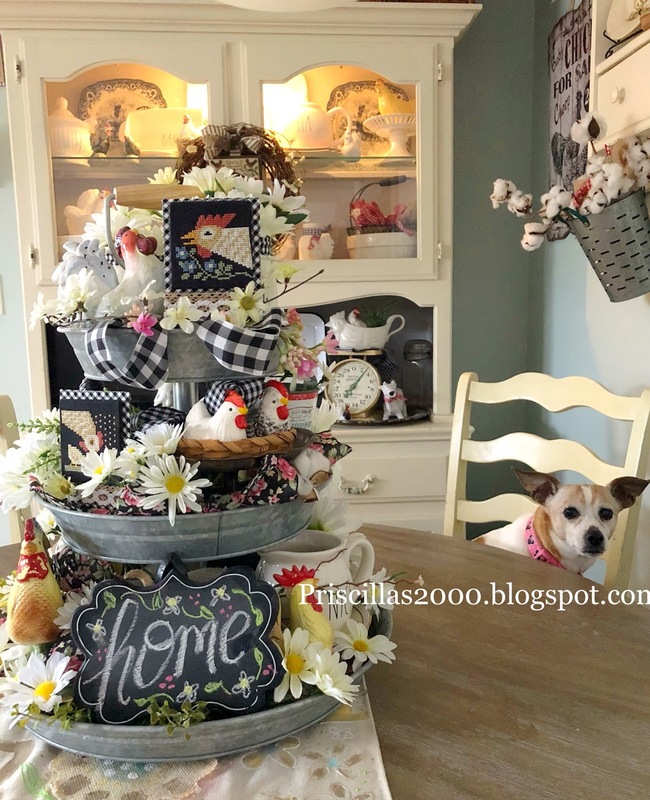 What a fabulous display Priscilla! 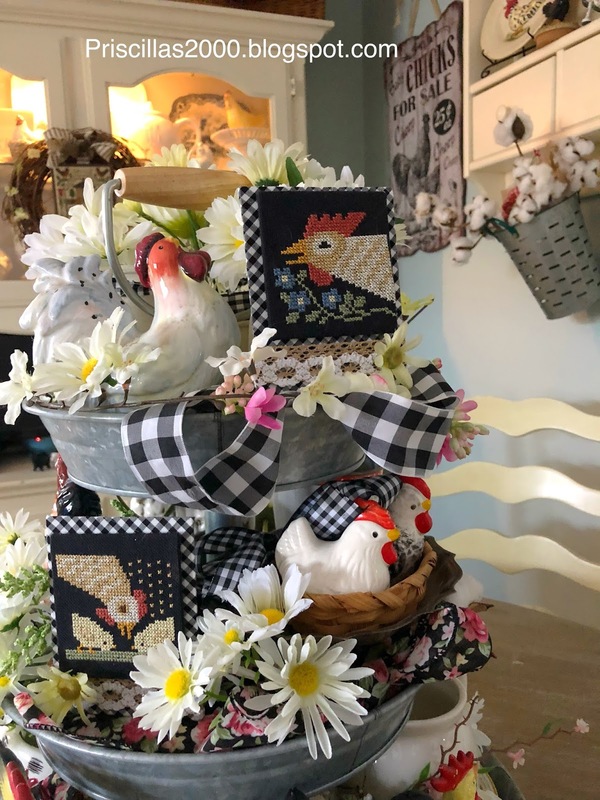 The chickens and daisies look great against the black and white checks and I love the tiered tray. The meanest cat in America makes me smile every time I see him! 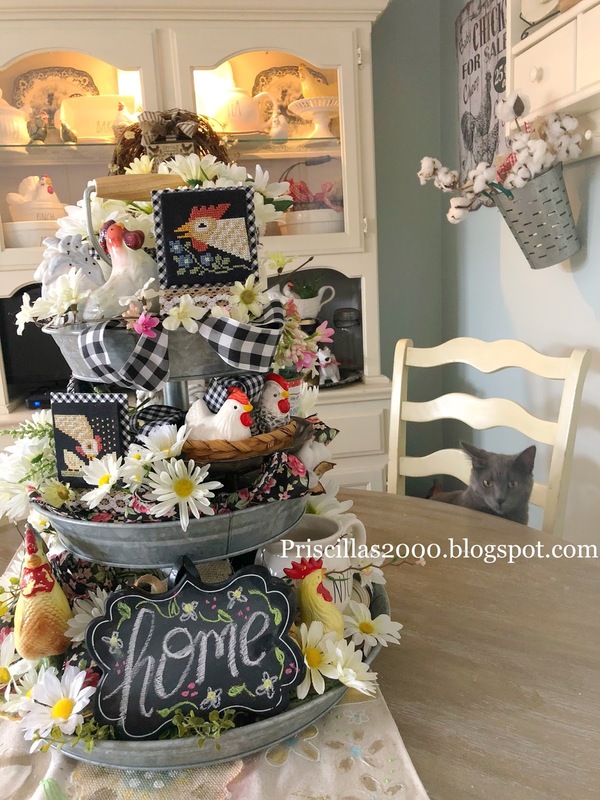 Think grumpy kitty is eyeing the chickens on the cute farmhouse tray:). So sweet . . . 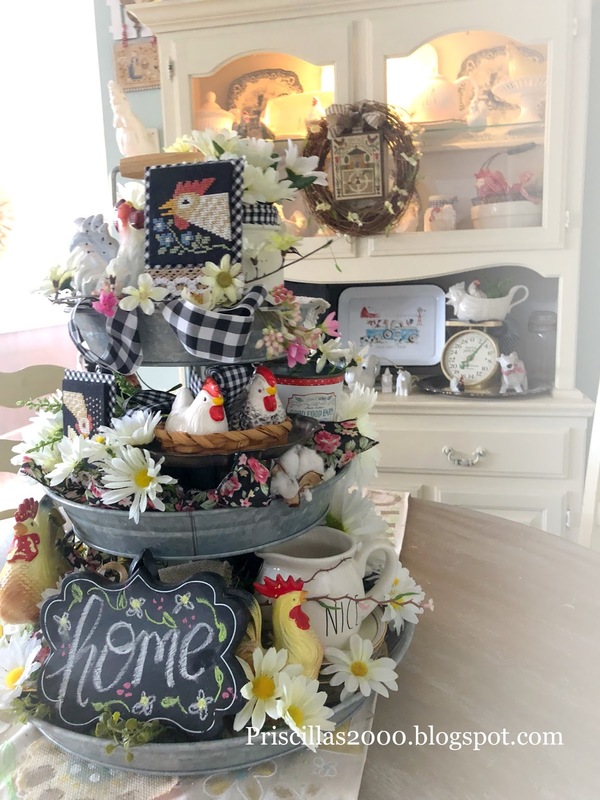 I'm a nut for chickens and farmhouse . . . Love this. 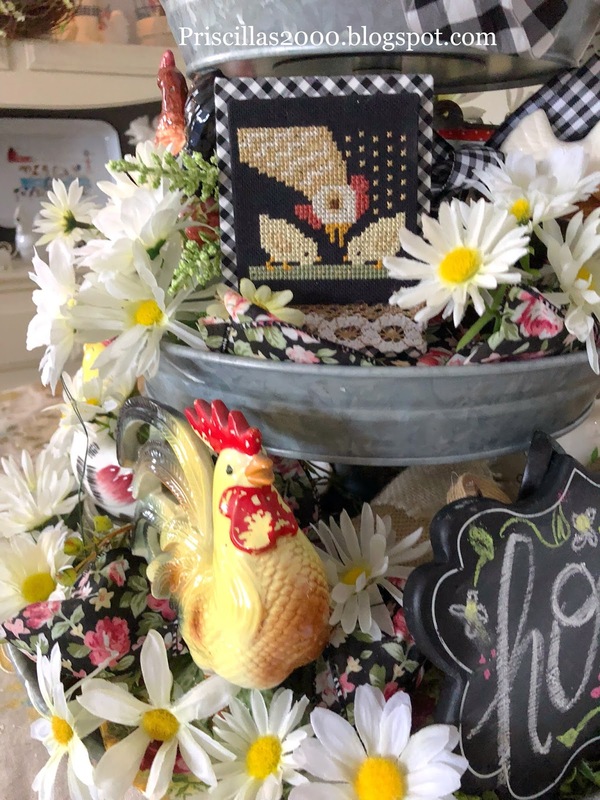 Those Chicken stitches are just adorable. I will not be stitching them (tho it IS tempting!! ), but... will just come to your blog for a fix every now and then!! Your tray is perfect! Thanks for sharing, as always!